We have Illinois' Largest Chevy Inventory! Structure My Deal tools are complete — you're ready to visit Phillips Chevrolet! 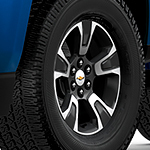 The Chevy Colorado has numerous features that keep passengers safe. Because it's a Chevy product, this truck has top-of-the-line tools that can boost safety on city streets and rural roads. Phillips Chevrolet is a great place to check out all of the standard safety features that make the Chevy Colorado unique. If you walk around the lot, you can observe the Colorado's durable steel frame along with the strong safety cage. In the cabin, there are more safety solutions that provide advantages on the road. Chevy's dual-stage airbags keep passengers safe during a collision, and the seat-mounted airbags provide an extra layer of protection. The Chevy Colorado also has head-curtain bags that cushion impacts in outboard seating locations. A Chevy Colorado pickup truck is built with strong materials, which is why it's a safe vehicle. Besides regular routines, this truck's safety tools also provide a variety of benefits during towing projects.